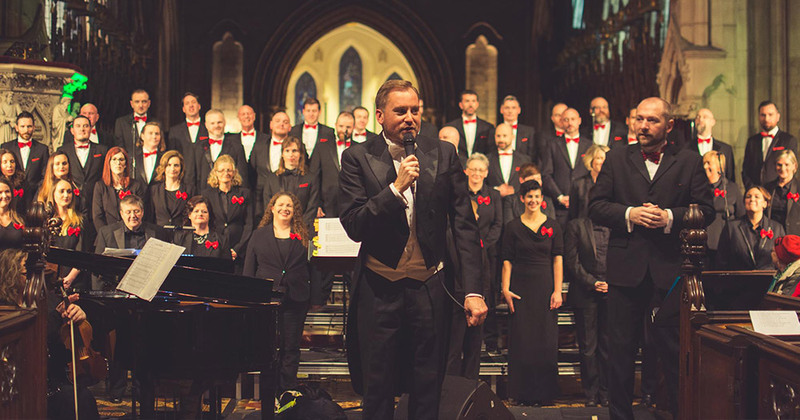 Glória, Dublin’s Lesbian and Gay Choir, was founded in October 1995. An ad placed in Gay Community News invited singers interested in forming a choir. About 25 people came along on that first night – some who still sing with the choir – and today we have a singing membership of around 54. The choir’s repertoire is wide ranging; from musicals to madrigals and from classical to camp. The songs are chosen sometimes to surprise, sometimes to challenge, but always to entertain! Founded in October 1995 Glória was originally established to provide a safe and comfortable space for gay and lesbian people to meet and sing together, and to promote a positive image of Ireland’s growing LGBT community. Glória maintains an environment that is inclusive, welcoming and supportive of people from all backgrounds and different life experiences irrespective of gender identity, or sexuality. Just as our repertoire is varied so is our membership, with singers from all walks of life. And for some it has been the place where they met their partner in love. Glória has performed extensively throughout Ireland in Dublin, Belfast, Carlingford, Castlebar, Cavan, Cork, Drogheda, Dun Laoghaire, Galway, Limerick, New Ross, Tralee, Sligo, Waterford and Westport. We are looking forward to adding to this list in the future. Do get in touch if you think you might be able to host a concert or if you would like to invite us to sing at some event or other. Click here if you’d like to book us for your event. Internationally the choir has traveled to perform in London on a number of occasions, and in connection with the GALA Choruses Festivals we have been to Montréal in Canada and twice to the US; to Boston, Miami and San José. In Dublin we have performed in the National Concert Hall, St. Patrick’s Cathedral, Christchurch Cathedral, Bord Gais Energy Theatre and the 3 Arena. We have performed in the Waterfront in Belfast and in the Royal Festival Hall in London. We have entertained in pubs, churches, community centres and schools. We have performed at discos, at railway stations and shopping centres, in parks and on the street. More than once we have been able to sing in wonderful venues such as Dublin City Hall and the National Gallery. We have sung at OutWest’s weekends – and then danced the night away! – at the Pride in the Park Parties in Dublin, making a lot of noise in the parade beforehand. Glória has taken part in the Waterford Pride programme and in local arts festivals from Sligo to Rathmines. Our repertoire lends itself to celebrations such as birthdays and now weddings, as well as to more solemn occasions like the AIDS memorials we have participated in. We usually audition for new members in early September and January of each year if there are vacancies. This year the deadline for our September auditions was Friday 11th August. A big thank you to everyone who got in touch, good luck at the auditions! For a good harmonious balance our MD likes to have an even set of voices and as there weren’t as many Tenors in touch as we expected we are extending the deadline for anyone interested in joining as a Tenor till Monday 4th August. Auditions will be held on Tuesday 5th September at a city centre location. If you are interested in joining us, I have detailed below a few frequently asked questions about becoming a member of Gloria DLGC. I hope you find them useful. We have two seasons a year starting in January and September. Usually each season starts with some auditions if there is space within the choir. What kind of music does the choir perform? We perform a diverse range of music which includes everything from classical to pop, musicals to madrigals etc. Do I have to audition? What will that entail? Yes. We will hold auditions on one day only. The audition comprises of a number of parts. You will be asked to sing some basic scales to ascertain which section the Musical Director thinks would best suit you. You will then be asked to sing a few lines from a song of your choosing or one suggested in advance by the Musical Director. Finally, we go through the time commitments and expectations we will have of you if you are successful in your audition. It is a very informal and friendly audition in the presence of our Musical director and a member of the choir. Who can join the choir? Anyone who has a nice voice basically and whose voice will compliment the others in the section! Although we are an LGBT choir, we are open to anyone irrespective of their sexuality, background or gender identity. We are an adult choir, so you must be over 18. You will be contacted sometime during the following week and we will let you know whether or not you have been successful. We do not maintain lists following the completion of an audition process, so if you do not turn up, cannot take up an offer or are not successful you will need to apply again via this process. If you were in the choir years ago, you will need to audition along with everyone else. It is your responsibility to make sure you sign up using the procedure outlined. Please do not assume that you are on our list if you do not follow the procedure outlined. We do not accept applications made to the committee, other members or the Musical Director. Are there always spaces available? The number of spaces that are available each season varies and depends on how many current members decide to either leave or take a break. We rehearse every Tuesday from 7:30pm – 9:30pm in the city centre and members are ideally expected to attend all rehearsals. We also have a weekend away usually in November for current members to rehearse and hone our technique. Once a month we have Sunday workshops/sectionals from 1:30pm – 5pm in Rathmines. How much of a commitment is it being in the choir? At certain times of the year it can get very busy preparing and rehearsing for key performances. You will also need to spend some of your own time rehearsing and learning the repertoire as you will need to memorise songs and choreography for all performances and competitions. Although we are an amateur choir, we strive to achieve a high performance standard. Yes. There is a annual membership fee and weekly subscription fee to pay which covers the cost of music and room hire etc. Do I need to provide my own performance outfit(s)? Yes. For our main concerts we generally wear a smart formal outfit which we ask you to provide. The choir may subsidise the cost of accessories to compliment your outfit. Our uniform may change from season to season and is customised for each event. For our community events and informal gigs, we usually wear Gloria t-shirts which will be provided to you at a subsidised rate. Usually we perform in Dublin city in various locations and venues; everything from community fundraisers to the grandness of St. Patrick’s Cathedral for our epic Christmas concert. Occasionally we are invited further afield, it varies from year-to-year. In recent years we have been entering a number of national choral competitions and many of them are outside of Dublin. Our performances are usually recorded for our own use and choir promotional purposes such as our YouTube channel or Facebook pages. Other times, we are asked by TV companies to perform on their shows/programmes. In joining the choir we assume that most people wouldn’t have an issue with that, however it shouldn’t be a barrier to joining either. Is there a social element to the choir? Oh yes! We are also a very sociable group! The Tuesday rehearsal is usually followed by drinks at a pub nearby and in addition to this there are many events organised throughout the year either by the committee or other choir members to cater for all tastes! We also have an annual residential weekend away and every couple of years we travel overseas to take part in LGBT choral festivals. So what are you waiting for? If you think you are interested in joining the choir or have any other questions about becoming a choir member that are not answered below please feel free to drop me a line, I would love to hear from you. Feel free to browse the rest of the site and read the more about us to get even more of an insight and see how much fun we have.